Air pollution kills 3.3 million people a year worldwide, including 55,000 Americans, according to a new study by an international group of scientists. 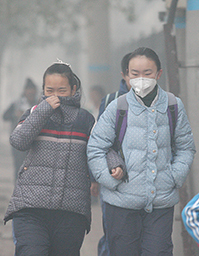 Moreover, airborne pollutants, especially carbon dioxide (CO2), are contributing to global climate change. In response, President Obama, frustrated by congressional inaction, has used his executive authority to institute a sweeping plan aimed at limiting CO2 emissions from coal-fired power plants, curbing smog-causing ozone and encouraging the growth of renewable energy. Industry officials are challenging Obama's Clean Power Plan in court, arguing the regulations are too costly and that market forces are enough to bring about reductions in pollution. Environmental advocates dismiss those claims and say the administration should have gone further in tightening emission standards. Meanwhile, the United States and almost all the other nations on Earth are set to begin climate talks later this month in Paris to seek consensus on ways to curb emissions to stave off further warming of the planet.